The software engineer bio, as good as mechanical engineer biography, basically summarizes your career in the field and highlights your major accomplishments. Your professional bio can be used to help find employment, promote your own consulting business or establish your credentials as an expert for publishing purposes among other things. When done correctly it is an inexpensive and effective marketing tool for conveying your skills and experience to the reader. To write a good biography of an engineer it is important to determine the purpose you want to achieve and who the audience will be. Once you have established your purpose and audience you can select the best content for the bio that will help you achieve your goal. The most effective biographies are those that are designed to achieve a specific purpose and that target a particular audience. First of all, you need to make sure you’ve gathered all the relevant information about your career. You will need your academic achievements, career experience, programming knowledge, and any other pertinent skills. Keep it short. Since you might be using it for different purposes, from your personal website, your LinkedIn profile, your Twitter account, among others, you need to be able to summarize all your achievements. This may come as a challenge as you may think something is irrelevant when it is essential, or the other way around. Write it in the third person. You need to introduce yourself as if someone else was doing it. You can see it as an introspection exercise to learn more about yourself. However, keep it relevant and avoid talking about your inner fears. Take into account who your audience will be. Depending on who will be reading your bio, you will need to include different facts. However, if you want to write a generic one because you are not sure who will be reading it, avoid using technical language. Instead, write your bio in plain language. A professional biography for engineers is a short document and should be no more than a page in length. It should be written in the third person using a narrative style so that it reads like a story. Use language that is easy to understand and avoid technical jargon unless the bio is targeting others professionals in your field. Keep paragraphs short so that they can be scanned easily. Introduction. State who you are and what you do (software engineer). Give your current position and the duties and responsibilities involved. Personal information. This is optional and will depend on the particular circumstances. If you choose to include any personal details, limit yourself to one or two sentences. Don’t get too personal or include anything controversial. Contact information. Keep your purpose and audience in mind when writing a biography about yourself. Only include information relevant to achieving your purpose. It isn’t necessary to include everything. As long as the content is enough to establish your credentials and achieve your goal no more information is required. 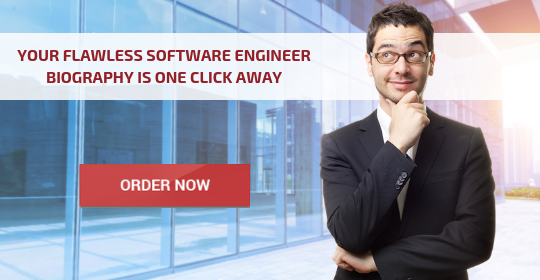 If you are unsure of the best way to write an effective professional biography for a software engineer our service is available to assist you. Writing an excellent personal profile software engineer for your website, resume, social media profiles, etc., can be a daunting task. 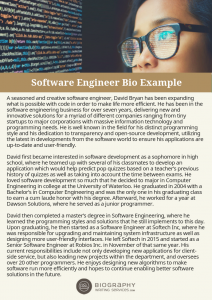 There are some vital facts your software engineer professional bio needs to include. Otherwise, the reader will not be able to learn about you. Crafting the perfect one can take a while, especially if you don’t know who your audience may be. Writing it in plain language is the best option in this cases. This way, you will be able to connect with a general audience. However, if you want to use your personal bio for your resume or for expanding your own personal business, then you can add some technicalities to it – this will help you position yourself as an expert in the field. When writing your personal bio, you will need to include your personal details – like your name, job title, and responsibilities. You will also need to add your academic and career achievements, as this will help you to restate your expertise and your personal interests. 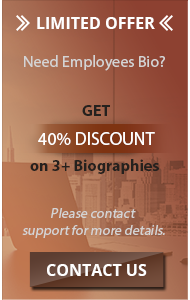 Our professional bio writing services provide high-quality biographies for any purpose and profession, whether it’s a software engineer or mechanical engineer biography that you need. The writers we use are college graduates and have a considerable amount of experience working with professional bios. Unlimited revisions to your biography at no additional charge. Our writer works with you until your bio is precisely the way you want. For an effective software engineer biography designed to achieve your objective, contact us and put our bio writing expertise to work for you!